If you follow Hooters Hall on Facebook or Instagram you will have seen some of my posts talking about transitioning to becoming a fibre farm. When we first started our smallholding journey we planned a mixed smallholding with a focus on raising rare breed pigs and growing herbs to flavour the sausages we would make in our own butchery. We did just that and our pork and sausages proved very popular. With a need to keep on top of the grass growth in our paddocks we decided to get some sheep about a year or so into our smallholding life. We started with three Jacob ewes and soon added a ram and some more ewes. Now we have a gradually growing flock, bred here at Hooters Hall. Its not all about the wool of course we also have some Angora goats and have bred our Golden Guernsey goats with our Angora Billy to produce goats that shed their fleece. With fibre comes fibre crafts and over the past 5 years I’ve progressed from improving my knitting skills to spinning my own yarn and learning to weave. We’ve also developed our skills in shearing and small scale fibre processing so we can process all the fibre we produce at Hooters Hall. It reached a point this year when we had to consider the direction we were heading in. With only six acres we have to plan how we can make best use of the land and as most smallholders discover the dream might be to work on your smallholding 24/7 but the reality is that most people have mortgages and that means earning a wage in non smallholding employment especially when you first start . So for a stress free life its important to find a balance between smallholding work and the day job. For us the life balance is with fibre farming. That doesn’t mean we won’t ever keep pigs and make our own sausages again but it won’t be the main focus of our smallholding. We’ll continue to grow our own veg, herbs and natural dyes but our choices about how we use the land, the buildings we have and the equipment we invest in will be made with the goal of fibre farming rather than mixed smallholding. So what does fibre farming mean ? There’s a long history of sheep farming in Britain but fibre farming is slightly different. We raise sheep and goats to produce fibre for fibre crafts rather than meat or for selling livestock on to other farmers. 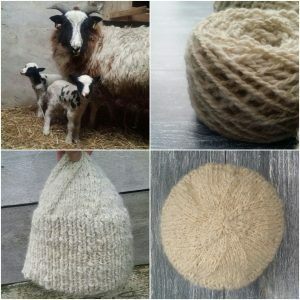 Some fibre farms focus on producing commercially popular fleeces and having their fibre spun into yarn at fibre mills. At Hooters Hall we’re aiming for something slightly different. We want to produce fibre for handspinning, weaving and felting. Our goals aren’t just about fibre production but also fibre crafts. We want to process all our own fibre share our knowledge about small scale fibre processing, inspire people to learn about fibre crafts and develop their own skills in using fibre and creating for themselves. In the medium to long term that might mean hosting fibre retreats here at Hooters Hall and maybe expanding our fibre processing with investment in mini mill equipment. Right now it means sharing our knowledge about fibre processing, fibre craft projects and selling the fibre from our Jacob sheep and Angora goats. 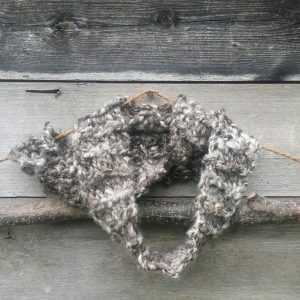 So with that in mind here’s my latest knitting project the Shepherding Hat. 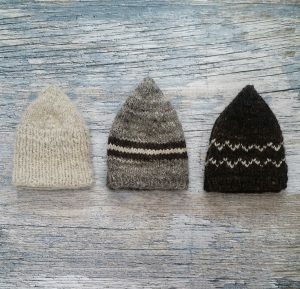 I wanted a simple beanie style hat to wear when I’m doing shepherding tasks. 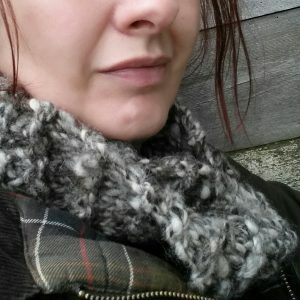 It needed to be a dense fabric to keep those winter winds out, a snug fit so it would stay put when I’m busy shepherding and a quick and easy knit made from my own handspun yarn. This pattern is one size for adults. You need to be able to knit in the round, make knit and purl stitches and do a knit 2 together decrease. Crown decrease (decrease 8 sts every other round) switch to double pointed needles when necessary, for me this is usually at round 7. 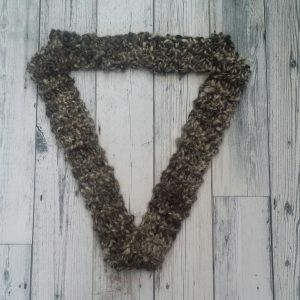 If you fancy a super speedy knit using our Hooters Hall handspun yarn this infinity scarf is the pattern for you. 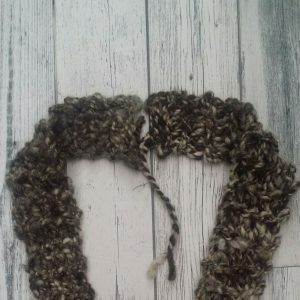 100g bulky weight Hooters Hall handspun yarn. 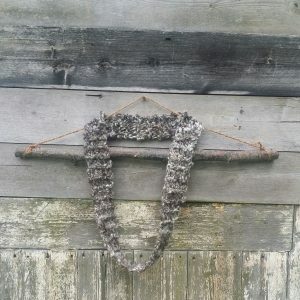 The pictures show a scarf knitted using our Fenland Mist bulky weight yarn. Leave a tail of about 18cm of yarn and cast on 5 stitches. Knit every row. Don’t knit too tightly or you will struggle to move the yarn along the needle. Cast off when you get to the end of the ball of yarn. Remember to leave enough yarn for your casting off. If you misjudge it just undo a couple of rows and try again. Block your scarf. Fill a sink or bowl with warm water. Put your scarf in the water for a few seconds holding it under the water. Remove and roll up your scarf in a dry towel. Give it a quick squeeze. Lay your scarf on another towel or blocking mats. 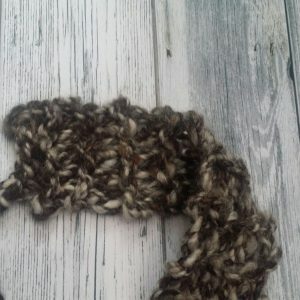 Pin at one end and work your way along the scarf gently stretching it out and pinning as you go. Once you’ve finished it should be at least 1m in length. It doesn’t matter if it’s a bit longer. Leave to dry for a few days. With a tapestry or weaving needle sew the two ends together using mattress stitch. You can use the long tail of yarn from your cast on edge. 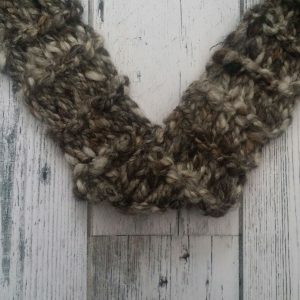 Alternatively you could use a different yarn but you will need to tie it to a stitch on the edge of your scarf first. That’s it. Your scarf should look like this. 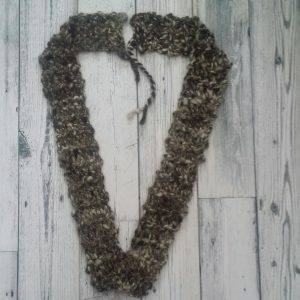 You can wear it as a single loop or twist and loop it around your neck twice.